Sitelinks are a feature in Adwords that allows you to create additional links to pages beyond the destination landing page in your advertisement. Common sitelinks are “free shipping” or “store hours”. The cost of a sitelink click equals the cost of a click on the display URL in the advertisement. You’ll be charged the same amount as you’d be charged for sending a visitor to a landing page. The benefits of sitelinks are easy to understand. You can link directly to high-converting sections of the website. You don’t need to make new text ads or edit them to include sitelinks. It should take you 5 minutes per day to update your spreadsheet. When you log the performance of your campaign, you always know if you’re performing well or not. The record keeps your PPC campaign on “top of mind”. Call tracking allows you to follow the source of an incoming phone call. The idea is to identify what keywords, landing pages, and ad messages are performing well. Once you ascertain the source of a phone call, you now have the ability to reverse engineer the phone call. If you are organized enough, you’ll be able to determine ROI of your PPC campaign with ease. For example, let’s say you spend $1,000 a month on PPC advertisements. After installing call tracking, you determine the PPC advertisements generated 100 phone calls that month. Now it’s time to look back and see how many of the 100 phone calls turned into a client. Call tracking software will help you determine the ROI of your PPC campaign. Calltrackingmetrics is the call tracking software I recommend for my readers. However, there are several other companies that offer this service. The Dimensions tab provides you the opportunity to analyze historical data from various viewpoints directly from the Adwords interface itself, rather than having to download reports. The Dimensions tab will save you time and allow you to find new keyword opportunities. Everyone wants to pay less for their ads. I’m sure you’ve thought of bidding $.05 a click and laughing all the way to the bank! Unfortunately, Adwords is a “pay to play” game. You MUST bid enough money to garner some clicks. I’m not saying you need to be in the 1st position of every keyword. However, I’m saying you should be prepared to bid a significant amount of money when first launching a campaign. If you’re not willing to bid enough money to compete for clicks, PPC probably isn’t the best traffic generating source for you. It takes hard work, talent and testing to beat the competition in the PPC world. If you can’t dedicate time each day to improve your PPC campaigns, consider hiring a professional. The typical PPC management firm will take a percentage of your overall spend with a minimum monthly management fee of $200-300. The fees are worth every dollar. Just make sure you have them build reports on a weekly or monthly basis that shows cost per acquisition or cost per sale. Remarketing uses a special tracking code to place cookies on the computer of people visiting your website, and then serving those ads with that cookie. In other words, you have the ability to send an advertisement (usually a banner ad) to someone that visited your website and left without filling out a contact form (a majority of your traffic). 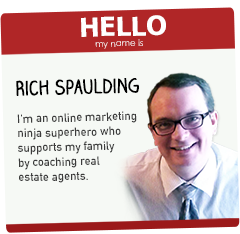 Remarketing is an extremely powerful weapon for real estate agents. It might take 5-7 appearances in front of a potential client to brand yourself. Remarketing makes it possible to hang around a possible client while they browse other websites. Click here to learn more about remarketing within Adwords. Many home buyers and sellers are using tablets to browse the internet. When looking at your PPC ad results, check the results by the device. You might be surprised to find an advertisement performing well with mobile but struggling with desktops. Business is a war. Either you win or lose. If your city is loaded with tough competition, you should highly consider creating advertisements on their brand name. When someone searches for their brand name, your ad will pop up. Pro tip: Create an ad that explains the difference between your company and the competition. Bing Ads Intelligence Tool is the rival to Google’s keyword planner. Download the tool and use it as a plugin for Excel. Not for Mac users. Sorry. Rotate ads and split test. Often. Split testing ads is probably the best PPC tip I can provide you. How does it work? You create an advertisement for a particular keyword or keywords. When finished, you create ANOTHER ad for that same keyword or keywords. Setup the advertisement to rotate equally (50% each). Let the ads run for enough time to pick a winner. Not sure if you’ve run the ad long enough to determine a winner? Use this tool: http://www.splittester.com/ The tool will provide a percentage on how confident the ads will have different long term response rates. Meaning, if you haven’t run the split test long enough, this tool will let you know. My rule of thumb is 90% or higher. If the tool tells me it’s 90% sure my split test results are accurate, I’m ready to declare a winner. After you have declared a winner, it’s time to create another ad and split test again. The purpose is to keep trying to improve the click through rate by tweaking your ads. You’ll notice that one or two tiny changes could improve or decrease the click through rate dramatically! I treat split testing like a game. I’m a competitive guy by nature and I hate losing. If you keep testing ads and try to beat yourself, eventually you’ll have PPC advertisements that are reaching their potential. You’ll lower your cost per click and increase your conversion rate. Win win! Adding negative keywords to your campaign will help decrease wasteful spending on pay per click. When first adding negative keywords, you won’t have much data to help you. You’ll want to think about words that don’t have much to do with your service. For example, if you’re a buyers agent, you want your ads focused on buyers. You’ll want to add the negative keyword “sell” because people interested selling their house is not your focus. Many PPC experts will recommend using 1-2 keywords per AdGroup. I’m in agreement with these experts, but performing that strategy will take a long time. If you’re interested in organizing your campaign, but don’t want to spend days organizing, use 20-25 keywords per ad group. Organization is the key with pay per click marketing. You want to swiftly log into your account, determine the performance of each Adgroup and make necessary changes promptly. If you’re having to spend hours digging for keyword performance metrics, you’re losing the game. Keep organized and save yourself the headaches. You’ve probably already know the importance of social media. I know some real estate agents that rely on social media as their sole source of leads. On the flip side, other real estate agents don’t need social media to be successful. I’m in the opinion that social media is like word of mouth marketing – on steroids. If people are going to speak highly of you and your services, they can do it quickly and to a bigger audience on social media. Social extensions is a way to establish credibility by showing people the number of Google+ followers your Google+ page has right now. You need 100 followers to qualify. If you already have 100+ Google+ followers, I encourage you to setup social extensions on your advertisements to help with credibility and improve click through rate. If you adjust your bid using these parameters, you’ll be optimizing the bid for optimum performance based upon the latest data. The call to action buttons on a landing page are crucial. What is a call to action button? Usually it’s a button or banner that provides instruction on what a person should do next after reading the article. Ideally, almost all your pages should have some sort of call to action button. Use Google Analytics to determine your most popular landing pages. Once you found the top three landing pages, test different call to actions on each one. Use different banners, colors, and sizes. Measure the results by creating goals within your Google Analytics account. Sending pay per click visitors to a landing page that has a high converting call to action button will increase your leads per month. Testimonials add credibility. Don’t forget to add credibility on your landing pages. Some people think testimonials are cheesy and nobody really cares. That couldn’t be further from the truth. The reality is people want to know you’re credible and the best way to achieve that credibility is to have people brag about you. If you’re an established real estate agent, ask for short testimonials from some former clients. If you don’t have many former clients, I would suggest offering some of your services for free in exchange for the possibility of a testimonial. Even though you won’t receive financial compensation for your work, you’ll be investing in your future by receiving the testimonial. If you don’t know your numbers, you don’t know your business. The same is true with internet marketing. Google Analytics is your source for all the numbers necessary to help with your website. You don’t need to pass the Google Analytics exam and become Google Analytics certified. However, you do need to understand basics like the difference between a session and a user. Google provides a helping hand by offering their Google Analytics Academy. Watch some of the videos and receive training straight from Google. Spend 15 minutes a week watching these videos. In a short time, you’ll know exactly who is visiting your website, what they do when visiting the website, and most important: How to improve the data. Be sure to test your landing pages using Internet Explorer, Google Chrome, and Firefox prior to sending PPC traffic to the landing page. In fact, you’ll want to test different mobile apps as well. Live chat can worth your time if your website already receives a decent amount of traffic. There is a segment of people that want help, but are not ready to pick up the phone just quite yet. Live chat adheres to those group of people. I recommend installing live chat onto your website and test for a couple months. Find a live chat software program that keeps track of the monthly data (almost all live chat software will do this). Look at the data. If these live chats are turning into leads, keep the software installed. If not, get rid of it. Live chat is “hit or miss”, but you’ll never know without trying. You need a scorecard. You need to know what’s working and what’s not working with your monthly PPC spend. When you setup goals inside Google Analytics, you’re creating a scorecard for yourself. For example, you want to know how many people filled out your contact form. You can setup a goal within Google Analytics to keep track of the number of conversions. Google Webmaster Tools now shows keyword data. In fact, Google Webmaster Tools shows organic search inquiries, your conversion rate, number of clicks per keyword and much more! Use this information to your advantage. Look at the top performing keywords. Are you bidding on these keywords using PPC marketing? Even if the keyword is performing well organically, I still recommend using pay per click marketing to double down on the success. Once a month, perform a cleanup of your PPC keywords. Look for keywords that have zero impressions with a minimum of 30 days of data. Delete these keywords. Keep your PPC account clean and tidy! Try 7search.com. You might find hidden clicks for cheap. Google. Yahoo. Bing. The big three search engines have dominated search for quite some time now. What about other search engines? Do people actually use them? Yes! There are a handful of search engines worth checking out. The one I’d recommend trying is 7search.com. Test it out for a couple months. I’ve found 7search.com a place where I can get extra clicks for super cheap. Fun and easy way to rack up reward points. Use a credit card that offers rewards as your online billing payment for PPC. If you’re really serious about your pay per click marketing (you should be), consider spending some time and receiving your Adwords certification. It’s not important you ace the exam. However, the time spent watching the tutorial videos and dissecting the Google vocabulary is time well spent. Pet peeve of mine: Reading several paragraph after paragraph of content without giving my eyes a break. Most people need some kind of mental break between hundreds of words on a page. Use bullet points, numbers, and pictures to provide your readers some fresh air. My rule of thumb: No more than four paragraphs without some kind of break. If using exact match (highly recommended), don’t forget to use singular and plural versions of keywords. I’ve made this mistake in the past and let many clicks slip through my fingers because I wasn’t paying attention. Don’t make the same mistake. Be sure to try out several types of call to actions in your PPC ads. Sometimes, the difference between a 2% click through rate and a 4% click through rate is the call to action. There is no magic call to action that performs better than all others. You’ll want to test several different call to actions to determine a winner. Broad match keywords can he a HUGE ROI or a money pit. Careful. As you can see, if you were bidding on the keyword “low-carb diet plan” and built a landing page for that specific keyword, wouldn’t you be upset if you were paying money for the keyword “Mediterranean diet plans”? Be very careful when using broad match. I’m not saying don’t use broad match, because when used correctly, broad match keywords can bring in tons of traffic. Just be careful. If you venture into the display advertising waters, be sure to set up a separate campaign. The click through rates will be much different using display advertising and you don’t want your data skewed because you were too lazy to set up a separate campaign. Remember, keep your PPC account tidy and organized. You’ll thank me later. Split ad testing – Test different ads and find a winner. Challenge the winning ad with another ad. Rinse and repeat. Landing Page Optimization – Make sure your advertisement matches your landing page. Are people clicking on your advertisement and leaving your landing page within five seconds? It’s time to adjust the landing page. I use and recommend LeadPages.net for your landing page source. Keep your keyword count under 25 for any Adgroup – If you keep adding keywords that aren’t related to your ad group’s advertisement, you’ll tarnish the click through rate. If you really want to stay ahead of the game, use 2-3 keywords for each ad group. The best PPC marketers are obsessed with their quality score. Provide something of value and establish trust/credibility. The person who downloads your “20 tips on selling your home” PDF is obviously interested in selling their home, but not ready to hire you as an agent. Follow up with that person via email and keep providing more value. Eventually, you’ll earn their trust and they’ll end up hiring you. Long-tail keywords work. Bid on them. What are long-tail keywords? Long-tail keywords are longer and more specific keyword phrases that have lower search volume. Instead of bidding on a keyword like “Atlanta Real Estate Agent”, you might consider bidding on “First Time Home Buyer in Atlanta”. The search volume will be much less than a popular keyword. However, the cost of a long-tail keyword is much cheaper because there is less competition. Also, you’ll notice that long-tail keywords convert higher. You might only receive one or two clicks a month with a particular long-tail keyword. That’s okay. You can counter that negative by bidding on several hundred or even thousand long-tail keywords! Did you know PPC can be used for SEO purposes? After a couple months of using PPC, you’ll find some keywords performing well. Many times, you never would have guessed some of those keywords would convert so well! Take advantage of that data. If you have keywords that are converting with PPC, they’ll convert organically too. Build content heavy pages around those particular keywords and optimize those pages for search. Landing pages are designed to convert into a lead. Always send PPC visitors to landing pages. Did you know you can schedule your pay per click ads for different times of the day? You might find that first time home buyers are looking for homes in the evening. Consider running those ads only in the evening. You might find that people looking to short sell their home are searching for help in the daytime. You can turn off those ads at night. Test your ads by switching times of the day. After a couple months of testing, you’ll find some ads perform better at night vs day. Some ads will perform better on weekdays vs weekends. Have you been playing the PPC game for over six months and can’t seem to show a positive ROI? Consider hiring an expert to conduct a PPC audit. Most PPC firms will conduct a PPC audit at no cost. Simply Google “PPC Audit” and find a PPC firm you feel comfortable using for your audit. There is a small debate in the PPC community about bidding on your own brand. Some people are convinced bidding on your brand is a waste of money. After all, if someone is searching for your business, there is a really good chance you company is the first search result. You’re just wasting your money, right? Wrong. You’ll notice most successful online businesses bid on their own brand. There is a reason. Why? Because they want to ensure people searching for their business, find their website. If a competitor decides to bid on your brand, they could be stealing clicks. Protect yourself and ensure people find your business by creating ads around your brand. What say you? What are some PPC tips working for you?